This innovative solution has been the subject of an internationally patent and has been designed to overcome the technical and aesthetic constraints of existing wall mounting brackets. The Néomitis® goal : Significantly reduce the installation time of the towel rails to the wall and stregthening security. Why use the innovative wall-mounting brackets Néomitis®? Time-saving installation : 4 screws in all, one screw per bracket. Easy to see for control of correct installation. Double Lock: Lock the depth by a self-locking pin and final lock installation by clipping. Innovative design: Transparency and clean lines of the brackets make them almost invisible and highlight the towel rails. Blends with any towel rail colour. The shape of the wall mounting base increases the adhesion of the brackets to the wall. Integrated compensators damper pads: small silicone pad automatically compensate the spaces between the tubes for a perfect fit. 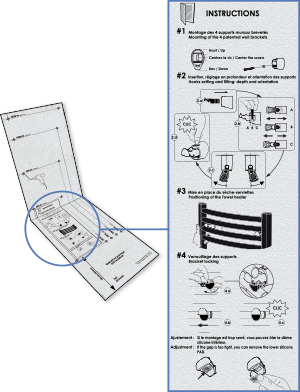 The mobile supports and pads ensure the maintenance of the towel rails in stable position, during the locking of the installation. On the drilling template of the towel rails, an illustrated summary recalls the main assembly steps of the brackets.